Bobby Dale, a radio veteran of KFWB, KRLA and KGBS in Los Angeles, and KEWB, KFRC, KSFO, KSAN, KKCY AND KOFY in San Francisco, died in San Rafael yesterday afternoon three weeks after he was diagnosed with liver cancer. He was 69. Bobby was born Robert Dale Bastiansen in Minneapolis. After a series of "weird jobs," he started in radio at age 25 in Glendive, Montana. From the very beginning, Bobby knew he had an uncanny knack to pick hit records and he loved music. Bobby went on to KOIL-Omaha, where he replaced Gary Owens and then to KDWB-Minneapolis. In 1961, the disc jockeys at KFWB went out on strike in sympathy for the newsmen. Management and Crowell-Collier sister station jocks were called. Bobby worked his 6-to-9 p.m. shift in Minneapolis, got on an airplane to Los Angeles and was on the air in B. Mitch Reed's shift the next night. (Reed flew to Minneapolis to replace Dale.) For a brief time Bobby worked at KFWB's sister station, KEWB, in the Bay Area and then returned to the Southland to work at KRLA. "That was the biggest I ever was in L.A. I played the Rolling Stones like the others were playing the Beatles, and I was huge," he said when interviewed for Los Angeles Radio People. He also worked at the legendary MOR station, KSFO San Francisco, in the late 1960s and for four more years beginning in 1971. During his years in San Francisco, he hung out with Tom Donahue in North Beach. He claimed to have taken Donahue on his first acid trip. In the mid-1970's, Dale did weekend shows at KSAN. In the early 1980s he worked at KTIM, The Big Band Blend, in San Rafael. Then back to San Francisco to work at KKCY "The City". He gave up radio as a full-time profession in the early 1990's. From time to time he appeared on the KSAN tribute series Jive Radio on University of San Francisco campus station, KUSF. In 1992 he lost his voice and an operation on his nodules was required. In preparation for the operation, it was discovered that he had diabetes, a heart problem and cirrhosis of the liver. "The doctor told me that if I had one more drink or one more cigarette, I would die," Dale complained. So he quit smoking and drinking and worked on improving his health. For much of the last half of the 1990s, he worked with youngsters at a pre-school in San Rafael and volunteered at a shelter that served food to the homeless. giant talent ...quietly giant. I really loved Bobby Dale," he said. "He was singular," said Ben Fong-Torres, author of The Hits Just Keep On Coming. 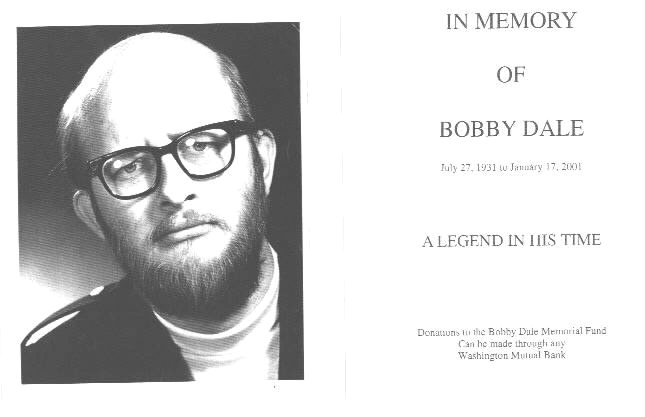 "Bobby had a jazz soul; a love of music ranging from pop to blues, folk & jazz. He loved breaking away from Top 40 and into the freedom he found at KSFO on the all-night shift and at the FM stations KSAN and KOFY. But even at Top 40, he was always his own guy, totally improv and off-the-wall, doing WC Fields/Lord Buckley-inspired riffs, goofing with live spots, and being so unpredictable that Chuck Blore once called him the worst DJ he'd ever heard, and then, months later, hearing him again, declaring him one of the best." Ben talked with Bobby two weeks ago. "All in all, I've had a pretty good ride," Bobby told Ben. When Ben asked how he was feeling, facing death and all, Bobby said, "I'm feeling fine, cracking jokes, you know. I don't know what else to do." Ken Levine emailed his condolences: "Sorry to hear this. I remember Bobby Dale doing late nights on KFWB. Always sounded friendly and talked one to one. He will be missed." Bob Morgan , who worked with Bobby at KGBS, was deeply saddened to hear about his passing. "Bobby was one of my heroes. I cannot put them in order because each one of them was at one time or another, responsible for my entire radio career, but there were three. Bobby was one of them. I remember hearing him for the first time on KFWB. I was young, but even at that age, I can remember thinking that nobody could be that funny and weird at the same time. I was hooked. This man had one of the most bizarre imaginations I had ever encountered. I never dreamed that one day I would be relieving him at KGBS. There's probably only a handful of people around that even remember he worked there. He was on from 7 to midnight, and he was great! I used to come in early just to rap with him. We bonded early on because I admired and respected him, and he saw something in me that he liked. "He was one of my mentors, and I shall always be grateful to him for passing on that incredible, strange sense of humor to me. I never met anyone in the industry who had more of a feeling for the music than Bobby - he did not just play the music, he listened to it. The gift that he had that was more precious though, was his ability to make people laugh when they otherwise would cry. He could point out humor in everything. And when he did, we all laughed. I gave him a pair of huge Superex headphones one night, and for some reason the headband left a big orange stripe on his bald spot. When I started laughing, and pointed it out to him, he said he was going to leave it there, and he did - for three days! He once told me: 'When this gets to be a chore, and it's not fun anymore, I'm getting the f--- out, forever.'" "When the GM at KGBS started putting 'guidelines' down for his show, he said he was leaving [he told me he never liked Southern California anyway], and he did. I came to work one night and he was gone. For those that never heard Bobby Dale, you really missed one of the true personalities of Los Angeles radio. For those of you who never got to know him, you really missed a truly nice man. I learned from him, I worked with him, and I knew him. I will miss him greatly. As will anyone who really knew him," concluded Morgan. Bobby would have been 70 on July 27. He is listed in the Rock and Roll Hall of Fame's Top 100 Disc Jockeys. He is given credit for breaking a national hit, Phil Spector's To Know Him Is To Love Him by the Teddy Bears out of Fargo, North Dakota. He also had a major role is exposing Mickey Newbury and his music to the world. Don Sherwood once called him, "the Disc Jockey's Disc Jockey." Bobby is survived by his wife, Norma Dale of San Rafael and their two sons, Joey, 18, and Tommy, 14. A son from a former marriage, John Bridell, 38, lives in Minneapolis.